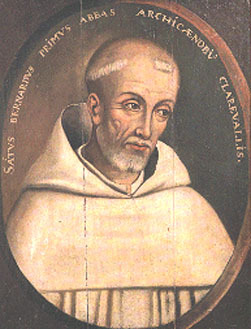 St. Bernard, Abbot of Clairvaux one of the most illustrious preachers and monks of the middle ages, was born at Fontaines, near Dijon, in France. His father, a knight named Tecelin, perished on crusade; and his mother Aleth, a daughter of the noble house of Mon-Bar, and a woman distinguished for her piety, died while Bernard was yet a boy. The lad was constitutionally unfitted for the career of arms, and his own disposition, as well as his mother's early influence, directed him to the church. His desire to enter a monastery was opposed by his relations, who sent him to study at Châlons in order to qualify for high ecclesiastical preferment. Bernard's resolution to become a monk was not, however, shaken, and when he at last definitely decided to join the community which Robert of Molesmes had founded at Citeaux in 1198, he carried with him his brothers and many of his relations and friends. The little community of reformed Benedictines, which was to produce so profound an influence on Western monachism and had seemed on the point of extinction for lack of novices, gained a sudden new life through this accession of some thirty young men of the best families of the neighborhood. Others followed their example; and the community grew so rapidly that it was soon able to send off offshoots. One of these daughter monasteries, Clairvaux, was founded in 1115, in a wild valley branching from that of the Aube, on land given by Count Hugh of Troyes, and of this Bernard was appointed abbot. By the new constitution of the Cistercians Clairvaux became the chief monastery of the five branches into which the order was divided under the supreme direction of the abbot of Citeaux. Though nominally subject to Citeaux, however, Clairvaux soon became the most important Cistercian house, owing to the fame and influence of Bernard. His saintly character, his self-mortification -- of so severe a character that his friend, William of Champeaux, bishop of Châlons, thought it right to remonstrate with him -- and above all, his marvellous power as a preacher, soon made him famous, and drew crowds of pilgrims to Clairvaux. His miracles were noised abroad, and sick folk were brought from near and far to be healed by his touch. Before long the abbot, who had intended to devote his life to the work of his monastery, was drawn into the affairs of the great world. When in 1124 Pope Honorius II mounted the chair of St. Peter, Bernard was already reckoned among the greatest of French churchmen; he now shared in the most important ecclesiastical discussions, and papal legates sought his counsel. Thus in 1128 he was invited by Cardinal Matthew of Albano to the synod of Troyes, where he was instrumental in obtaining the recognition of the new order of Knights Templars, the rules of which he is said to have drawn up; and in the following year, at the synod of Châlons-sur-Marne, he ended the crisis arising out of certain charges brought against Henry, Bishop of Verdun, by persuading the bishop to resign. The European importance of Bernard, however, began with the death of Pope Honorius II (1130) and the disputed election that followed. In the synod convoked by Louis the Fat at Étampes in April 1130 Bernard successfully asserted the claims of Pope Innocent II against those of Anacletus II, and from this moment became the most influential supporter of his cause. He threw himself into the contest with characteristic ardor. While Rome itself was held by Anacletus, France, England, Spain and Germany declared for Innocent, who, though banished from Rome, was -- in Bernard's phrase -- "accepted by the world." The pope travelled from place to place, with the powerful abbot of Clairvaux at his side; he stayed at Clairvaux itself, humble still, so far as its buildings were concerned; and he went with Bernard to parley with the emperor Lothair III at Liége. In 1133, the year of the emperor's first expedition to Rome, Bernard was in Italy persuading the Genoese to make peace with the men of Pisa, since the pope had need of both. He accompanied Innocent to Rome, successfully resisting the proposal to reopen negotiations with Anacletus, who held the castle of Sant' Angelo and, with the support of Roger of Sicily, was too strong to be subdued by force. Lothair, though crowned by Innocent in St. Peter's, could do nothing to establish him in the Holy See so long as his own power was sapped by his quarrel with the house of Hohenstaufen. Again Bernard came to the rescue; in the spring of 1135 he was at Bamberg successfully persuading Frederick of Hohenstaufen to submit to the emperor. In June he was back in Italy, taking a leading part in the council of Pisa, by which Anacletus was excommunicated. In northern Italy the effect of his personality and of his preaching was immense; Milan itself, of all the Lombard cities most jealous of the imperial claims, surrendered to his eloquence, submitted to Lothair and to Innocent, and tried to force Bernard against his will into the vacant see of St. Ambrose. In 1137, the year of Lothair's last journey to Rome, Bernard was back in Italy again; at Monte Cassino, setting the affairs of the monastery in order, at Salerno, trying in vain to induce Roger of Sicily to declare against Anacletus, in Rome itself, agitating with success against the antipope. Anacletus died on the 25th of January 1138; on the 13th of March the cardinal Gregory was elected his successor, assuming the name of Victor. Bernard's crowning triumph in the long contest was the abdication of the new antipope, the result of his personal influence. The schism of the church was healed, and the abbot of Clairvaux was free to return to the peace of his monastery. Clairvaux itself had meanwhile (1135-36) been transformed outwardly -- in spite of the reluctance of Bernard, who preferred the rough simplicity of the original buildings -- into a more suitable seat for an influence that overshadowed that of Rome itself. How great this influence was is shown by the outcome of Bernard's contest with Peter Abelard. In intellectual and dialectical power the abbot was no match for the great schoolman; yet at Sens in 1141 Abelard feared to face him, and when he appealed to Rome Bernard's word was enough to secure his condemnation. One result of Bernard's fame was the marvellous growth of the Cistercian order. Between 1130 and 1145 no less than ninety-three monasteries in connection with Clairvaux were either founded or affiliated from other rules, three being established in England and one in Ireland. In 1145 a Cistercian monk, once a member of the community of Clairvaux -- another Bernard, abbot of Aquae Silviae near Rome, was elected pope as Eugenius III. This was a triumph for the order; to the world it was a triumph for Bernard, who complained that all who had suits to press at Rome applied to him, as though he himself had mounted the chair of St. Peter. Having healed the schism within the church, Bernard was next called upon to attack the enemy without. Languedoc especially had become a hotbed of heresy, and at this time the preaching of Henry of Lausanne was drawing thousands from the orthodox faith. In June 1145, at the invitation of Cardinal Alberic of Ostia, Bernard travelled in the south, and by his preaching did something to stem the flood of heresy for a while. Far more important, however, was his activity in the following year, when, in obedience to the pope's command, he preached a crusade. The effect of his eloquence was extraordinary. At the great meeting at Vezelay, on the 21st of March, as the result of his sermon, Louis VII of France and his queen, Eleanor of Guienne, took the cross, together with a host of all classes, so numerous that the stock of crosses was soon exhausted; Bernard next travelled through northern France, Flanders and the Rhine provinces, everywhere rousing the wildest enthusiasm; and at Spires on Christmas Day he succeeded in persuading Conrad, king of the Romans, to join the crusade. The lamentable outcome of the movement was a hard blow to Bernard, who found it difficult to understand this manifestation of the hidden counsels of God, but ascribed it to the sins of the crusaders. The news of the disasters to the crusading host first reached Bernard at Clairvaux, where Pope Eugenius, driven from Rome by the revolution associated with the name of Arnold of Brescia, was his guest. Bernard had in March and April 1148 accompanied the pope to the council of Reims, where he led the attack on certain propositions of the scholastic theologian Gilbert de la Porrée. From whatever cause -- whether the growing jealousy of the cardinals, or the loss of prestige owing to the rumored failure of the crusade, the success of which he had so confidently predicted -- Bernard's influence, hitherto so ruinous to those suspected of heterodoxy, on this occasion failed of its full effect. On the news of the full extent of the disaster that had overtaken the crusaders, an effort was made to retrieve it by organizing another expedition. At the invitation of Suger, abbot of St. Denis, now the virtual ruler of France, Bernard attended the meeting of Chartres convened for this purpose, where he himself was elected to conduct the new crusade, the choice being confirmed by the pope. He was saved from this task, for which he was physically and constitutionally unfit, by the intervention of the Cistercian abbots, who forbade him to undertake it. The greatness of St. Bernard lay not in the qualities of his intellect, but of his character. Intellectually he was the child of his age, inferior to those subtle minds whom the world, fired by his contagious zeal, conspired to crush. Morally he was their superior; and in this moral superiority lay the secret of his power. The age recognized in him the embodiment of its ideal: that of medieval monasticism at its highest development. The world had no meaning for him save as a place of banishment and trial, in which men are but "strangers and pilgrims"; the way of grace, back to the lost inheritance, had been marked out once for all, and the function of theology was but to maintain the landmarks inherited from the past. With the subtleties of the schools he had no sympathy, and the dialectics of the schoolmen quavered into silence before his terrible invective. Yet, within the limits of his mental horizon, Bernard's vision was clear enough. His very life proves with what merciless logic he followed out the principles of the Christian faith as he conceived it; and it is impossible to say that he conceived it amiss. For all his overmastering zeal he was by nature neither a bigot nor a persecutor. Even when he was preaching the crusade he interfered at Mainz to stop the persecution of the Jews, stirred up by the monk Radulf. As for heretics, "the little foxes that spoil the vines", these "should be taken, not by force of arms, but by force of argument", though, if any heretic refused to be thus taken, he considered "that he should be driven away, or even a restraint put upon his liberty, rather than that he should be allowed to spoil the vines." He was evidently troubled by the mob violence which made the heretics "martyrs to their unbelief." He approved the zeal of the people, but could not advise the imitation of their action, "because faith is to be produced by persuasion, not imposed by force"; adding, however, in the true spirit of his age and of his church, "it would without doubt be better that they should be coerced by the sword than that they should be allowed to draw away many other persons into their error." Finally, oblivious of the precedent of the Pharisees, he ascribes the steadfastness of these "dogs" in facing death to the power of the devil. This is Bernard at his worst. At his best -- and, fortunately, this is what is mainly characteristic of the man and his writings -- he displays a nobility of nature, a wise charity and tenderness in his dealings with others, and a genuine humility, with no touch of servility, that make him one of the most complete exponents of the Christian life. His broadly Christian character is, indeed, witnessed to by the enduring quality of his influence. The author of the Imitatio drew inspiration from his writings; the reformers saw in him a medieval champion of their favorite doctrine of the supremacy of the divine grace; his works, down to the present day, have been reprinted in countless editions. This is perhaps due to the fact that the chief fountain of his own inspiration was the Bible. He was saturated in its language and in its spirit; and though he read it, as might be expected, uncritically, and interpreted its plain meanings allegorically -- as the fashion of the day was -- it saved him from the grosser aberrations of medieval Catholicism. He accepted the teaching of the church as to the reverence due to our Lady and the saints, and on feast-days and festivals these receive their due meed in his sermons; but in his letters and sermons their names are at other times seldom invoked. They were overshadowed completely in his mind by his idea of the grace of God and the moral splendor of Christ; "from Him do the Saints derive the odor of sanctity; from Him also do they shine as lights." The cause of Bernard's extraordinary popular success as a preacher can only imperfectly be judged by the sermons that survive. These were all delivered in Latin, evidently to congregations more or less on his own intellectual level. Like his letters, they are full of quotations from and reference to the Bible, and they have all the qualities likely to appeal to men of culture at all times. "Bernard", wrote Erasmus in his Art of Preaching, "is an eloquent preacher, much more by nature than by art; he is full of charm and vivacity and knows how to reach and move the affections." The same is true of the letters and to an even more striking degree. They are written on a large variety of subjects, great and small, to people of the most diverse stations and types; and they help us to understand the adaptable nature of the man, which enabled him to appeal as successfully to the unlearned as to the learned. Bernard's works fall into three categories: (1) Letters, of which over five hundred have been preserved, of great interest and value for the history of the period. (2) Treatises: (a) dogmatic and polemical, De gratia et libero arbitrio, written about 1127, and following closely the lines laid down by St. Augustine; De baptismo aliisque quaestionibus ad mag. Hugonem de S. Victore; Contra quaedam capitala errorum Abaelardi ad Innocentem II (in justification of the action of the synod of Sens); (b) ascetic and mystical, De gradibus humilitatis et superbiae, his first work, written perhaps about 1121; De diligendo Deo (about 1126); De conversione ad clericos, an address to candidates for the priesthood; De Consideratione, Bernard's last work, written about 1148 at the pope's request for the edification and guidance of Eugenius III; (c) about monasticism, Apologia ad Guilelmum, written about 1127 to William, abbot of St. Thierry; De laude novae militiae ad milites templi (c. 1132-36); De precepto et dispensatione, an answer to various questions on monastic conduct and discipline addressed to him by the monks of St. Peter at Chartres (some time before 1143); (d) on ecclesiastical government, De moribus et officio episcoporum, written about 1126 for Henry, Bishop of Sens; the De Consideratione mentioned above; (e) a biography, De vita et rebus gestis S. Maiachiae, Hiberniae episcopi, written at the request of the Irish abbot Congan and with the aid of materials supplied by him; it is of importance for the ecclesiastical history of Ireland in the 12th century; (f) sermons -- divided into Sermones de tempore; de sanctis; de diversis; and eighty-six sermons, in Cantica Canticorum, an allegorical and mystical exposition of the Song of Solomon; (g) hymns. Many hymns ascribed to Bernard survive, e.g. Jesu dulcis memoria, Jesus rex admirabilis, Jesu decus angelicum, Salve caput cruentatum. Of these the three first are included in the Roman breviary. Many have been translated and are used in Protestant churches.